I’ve been in Cape Town for 10 years now and fine back when I was a student I only waited to eat tripe when I went home for the school holidays. Now living on my own I mean I cook for myself. In all this time I’ve never seen the green tripe sold in shops I always buy it from a back of a van (from the farms) or from a spaza shop in the townships. Trust me when you want something you are used to you go hunting for it. That was the case with me and the green tripe until a friend of mine told me they sell it at Gugulethu SuperSpar. Man, I have to give credit when it is due. Those guys sell fresh green tripe, as fresh as you can get in fact you….that’s how I like my tripe. I’m one of those people who strongly believe that the flavour of the tripe lies in the green colour. I mean it is green because the animal ate grass and there’s nothing wrong with grass it only adds flavour. Trust me I’ve got nothing against the white tripe it also tastes quite good it’s just a matter of personal preference. I was chatting with an Indian friend she tells me they boil their green tripe and wash it like crazy after boiling…they scrub it like hell until it’s white…hehehe! It’s crazy huh? Anyways I suppose its different strokes for different folks. You know in Xhosa we call the dish Ulusu and the intestines are included. Sotho and Tswana cultures call it Mogodu but when the intestines are included it’s called Mala le mogodu. Mogodu is one of two dishes I know that get a disdainful reaction followed by an “eeeeeuuuw” at the mention of the name. The other one is Mopane worms. You should see people’s reactions when you talk about eating Mogodu. People tend to forget that we’ve got to respect other culture’s foods. I was taught that it’s rude to sneer at someone’s food or make rude remarks. Back in the Eastern Cape, I cooked it just as is and just add salt and onion. Honestly, tripe is just plain delicious like that. , hen in Cape Town I noticed that people shooz it up with some carrots, potatoes etc. and its quite good. 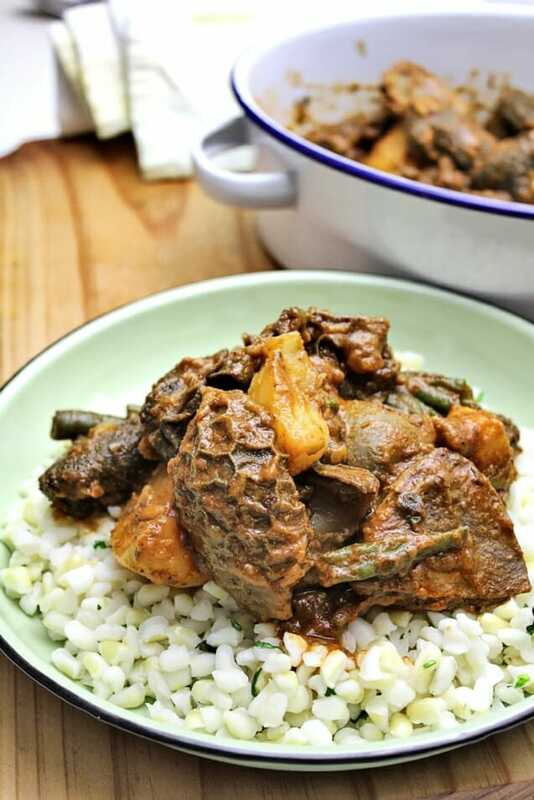 One of my twitter darlings Sindy van Zyl asked for a simple tripe recipe and she is having a problem with the hardening up of the dish as soon as you dish it up. Trust me I’ve always had that problem as well but it never occurred to me to look at how it can be solved. So I bought my fresh green tripe from Gugulethu SuperSpar (yes I drove all the way just to get the tripe), took it home and I cleaned it under running water. I thought let me remove all the fat and just cook it like that then see whether it will harden up still. Guess what? It worked and the best thing is that even after an hour at room temperature you won’t find it hardening up. There you go Sindy, problem solved! Happy Cooking! Clean the Mogodu thoroughly under running water and use your kitchen scissors to cut it into cubes. In a big saucepan cook the mogodu at low heat first in 500ml water, add the bay leaves garlic, ginger. Add the rest of the water with stock cube dissolved in it; onion, green beans and chilli then continue cooking until the tripe is soft. Add the potatoes towards the end of the cooking process. Also add salt and tomato paste. Serve with samp, pap, dumplings or steam bread. One tablespoon of lemon juice or vinegar can be added to the cooking water to reduce the odour. If you like dumplings can be cooked with the tripe. I’ve seen some people serve their food with the bay leaves, please remove them before serving. You know in the Cooking with the president book, they say adding rosewater also helps with the smell. I have some tripe in the fridge, courtesy of Mother in law. I was going to make the recipe in the president’s book, but think Im going to try your recipe. Hi there, thanks for your comment. I’ve never tried the rosewater, I’ll give it a shot next time. On the other hand lemon juice and vinegar are more accesible to people and they’ve been tried and tested. Let me know how the dish works out for you. This recipe is new to me. it looks nice. Please come home and prepare it for your mom cousin and siblings.we want to enjoy it with you. Will do! :-) I’ll be home on my birthday! Bought mogodu last week, cleaned it, threw it in the freezer! Been looking for a nice yet simple recipe on how to make it… I will mos def try this one on Monday… Tx Thuli! Hi Aziza! Thanks for your comments! Let me know what you think of the recipe. Happy Cooking! Thuli please share how i can make the dumpling.. I love it but haven’t had it for years.